Directions: The knowledge test is based on information contained in this driver’s manual. To pass the knowledge test, you must demonstrate a basic understanding of Indiana traffic laws and safe driving techniques, and you must be able to read and understand highway signs regulating, warning, and directing traffic. Knowledge tests include multiple choice questions concerning traffic maneuvers and knowledge of types of traffic signs. If you fail to pass a knowledge test, you must wait until the next business day to take the test again. The knowledge test consists of 16 sign identifications and 34 questions of which you can only miss two signs and six questions to pass. To keep the front wheels straight. In the direction you want the vehicle to go. In the opposite direction of the skid. In any direction. It doesn't matter. If your vehicle goes into a skid, you should turn the steering wheel in the direction you want the vehicle to go. As soon as the vehicle begins to straighten out, turn the steering wheel back the other way. An approaching driver fails to dim their high beam headlights. Where should you look? At the wheels of the approaching vehicle. Toward the right side of the road. Toward the left side of the road. Straight down the middle of the road. If an approaching driver fails to dim their high beams, glance toward the right side of the road. This will keep you from being blinded by the other vehicle’s headlights and will allow you to see enough of the road to stay on course until the other vehicle has passed. Construction zones pose dangers to both drivers and construction workers. Orange highway construction signs warn drivers to be careful when encountering construction zones. 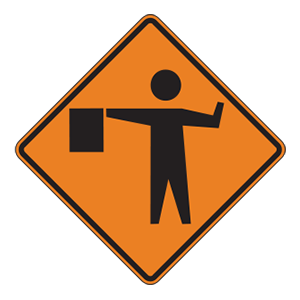 This sign tells drivers that a flagger is ahead and will be giving directions that should be followed. A driver with a blood alcohol level of 0.08 percent is driving under the influence. Conviction of driving under the influence may result in a fine, imprisonment, or both. He or she is a police officer. He or she is blind. He or she has poor balance. When driving near a blind pedestrian who is carrying a white cane or walking with a guide dog, you must slow down, yield the right-of-way, and then proceed with caution. Be prepared to stop your vehicle in order to prevent injury or danger to the pedestrian. You are moving faster than the bicycle. The bicycle always has the right-of-way. Oncoming traffic may not see you pull out to pass the bicycle. The cyclist may have to swerve into traffic to avoid an object on the road. You should always be cautious when passing a bicycle because the cyclist may have to swerve into traffic to avoid an object on the road. Always be particularly careful when driving near bicyclists. Jerk the steering wheel to force the vehicle back onto the pavement. Speed up and steer back onto the pavement gradually. Slam on your brakes and stop. Slow down by gently using the brakes. Turn the steering wheel to return to the pavement at a safe speed. If your vehicle begins to leave the road, continue to drive with the wheels off the pavement and reduce your speed by gently applying the brakes. When at a safe speed, turn the steering wheel to return to the pavement. Do not attempt to force your vehicle back onto the pavement by sharply turning the steering wheel.